At Area Appliance Service, we repair and service GE (GE Profile) residential appliances, as well as ALL top appliance brands and models. If you need help determining whether you should get your General Electric appliance fixed or if buying new is more cost effective, please give us at (847) 459-8070. We can also be reached online, just fill out our brief form below and we’ll get back to you promptly. We can repair your broken General Electric appliance the same day! Area Appliance services the Buffalo Grove and Arlington Heights areas. 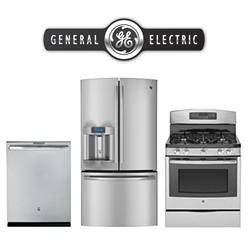 We are simply the best in repairing or servicing your General Electric appliance. Be sure to only hire an experienced GE appliance repair company or you might run into some quality and billing issues. We are certain that with our six decades of experience repairing GE machines, we’ll fix your appliance right the first time around. Our techs are professional trained by the factory, licensed, bonded and always insured. Our vans are fully loaded with common GE parts and supplies. We DO NOT service or repair GE manufacturer’s warranty work. If you would like to get manufacturer’s warranty service, please refer to your GE appliance owner’s manual for their warranty hotline. Schedule Service for Your GE Appliance Today!